Are you pat down with the “V” shaped recovery or perhaps the “U” shaped recovery? Or perhaps, you’re attuned to stair stepping model of recovery that is headed to the dungeon of doom (nefarious toothless grin on my face)? As you might gather from the dates between the last post and this one, I’ve been so long in the dungeon of doom, it is so dark there, that I’ve made only the slightest efforts to surface albeit with a severe case of decompression. I am decompressing actively now and hopefully I don’t get an acute case of the bends. It must come a sigh of fresh air to a bureaucrat when a cursory sampling of the latest uproar on his table reads, “Extravagant bonuses at bailed out banks, unemployment and regulatory loopholes.” These are the bread and butter of a bureaucracy – incompetence, corruption, ad hoc rules, fly by night consultations and visitations – what bureaucrat is unfamiliar with those, thses can be dealt with, even swiftly if the overlords in the political world so desired it. What a bureaucrat cannot deal with is “Value”. To illustrate, chain a man to a treadmill with rules and regulations – now, that is an easy thing in and of itself. The cheery bureaucrat will write himself a bonus for this task and no doubt countless pages of regulation that no one other than his cousin the lawyer would ever read. Why a man would run on a treadmill of his own accord – that is a secret that a bureaucrat cannot ever hope to fathom? So what does he do in the face of the latest tumult, order more treadmills and more importantly, more chains. But this is not a question of sensibility (there’s that bearishness creeping right back in). When the agents of the government go on offense, even in a haphazard way as is their wont, even style, you’d better take note. My pocketbook took a lot of hits because I insisted on reason – governments, as I have been educated, insist on a different kind of reason. The stimulus (and all others to come) – borrow against future tax receipts but spend it today. Cash for clunkers – Destroy a working (polluting?) car and go into debt for a new one with a little help from us – save the earth, save on oil but tie this chain around your neck. Homebuyer’s credit – The first $8000 is on us, the next sum of an order 100 times our bait is on you – go into debt for the sake of cycling those homes through the market, er, no better time to buy a house. FDIC is broke – This program which operates through the fees collected from the participating banks is floating a plan to have its members pre-pay up to three years of future dues in order to resume its mission of finding, taking control and then reopening failing and failed banks. (b) government enticing homebuyers with a credit and saddling them with homes the value of which they are certain would crater if they didn’t endeavor this way to get their citizenry into debt. Of course, if the home prices still declined, though at a lesser pace, we would revisit this same issue a few years later. In an insane world, if a bunch of guys were determinedly pouring water into a sinking ship, they would be keelhauled without delay. However, in this sane world, determined guys can pour more water into a sinking ship by pointing out that only then would the ship’s pumps be fully utilized. Furthermore, this is widely praised as distinguished public service. So what then of the recovery, “V”, “U”, “L”, “W”. twenty two letters to go? To me, this is a “C” shaped recovery i.e. 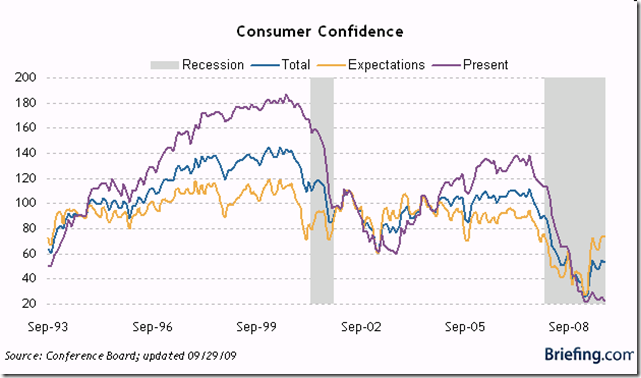 “Consumer” shaped recovery. I’m in the least concerned about the shape of the recovery. I’m more concerned about the consumer, the customer – the true end point of every supply chain. From my vantage point, talk about the shape of the recovery treats the consumer as the animal that he is (as in the repository of the animal spirit) – to be whipped onto the next treadmill of consumption and debt until he collapses. And this is my contribution to the masters of the supply chain universe – if you can, for a minute, get away from the forecasts of recovery, and the talk of priming the supply chain pump, long lead times, weak dollar and what have you, and ask yourself – how is my customer dealing with a drawdown in credit lines, loss of equity in his home, chopped liver in his 401K.? In looking at the coverage of the consumer and businesses, we have gone from “Things are terrible” to “Things are bad”. However, now, I note an impatience to getting to “Things are great” while I’m expecting a “Things are not so bad” followed by “Things are Ok” followed by “Things are not so bad” followed by “Things are Ok”. The policy actions of this administration and the next would set the direction of that cycle in motion and there is every evidence that we’re gearing up for more spending, more debt, pressure from creditor nations and so on. 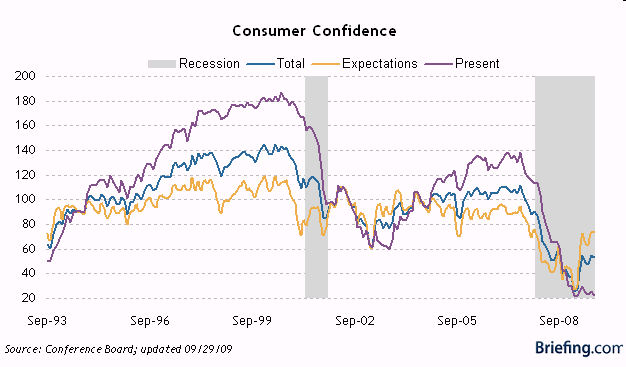 Consumer sentiment indices get way too much attention. The simple fact is that sentiment does not correlate strongly with consumer spending and thus has little predictive value. Consumer spending correlates more closely with income. Sentiment tends to reflect well known factors such as unemployment rates and gas prices more than it predicts future spending patterns. A top White House economist says spending from the $787 billion economic stimulus has already had its biggest impact on economic growth and will likely not contribute to significant expansion next year. But I thought the bulk of the stimulus effect would be felt in 2010 and not in 2009 – What’s the deuce here? As this CNN story notes from January 2009: Stimulus will take a while to work. All in all, the legitimate infrastructure spending, which in its expanded form would include Obama’s ambitious plans to invest heavily in renewable energy sources, will most likely not start coming on line until the fourth quarter of the year and its full effect is at least 12 to 18 months away. In other words, the fiscal stimulus measures that the incoming Administration will be pushing through are more a 2010 story. Only about a third of the stimulus funds – some $275 billion – are going to grants, contracts and loans that will be tracked on Recovery.gov. The 30,000 jobs reported so far cover only direct contracts, which represent $16 billion of that total. So what can one conclude from this sorry state of affairs? What can one say about the “C” in the “C” shaped recovery? In a post a little while back, I had noted that there will be many more stimulii in the pipeline and one can already see the trial balloons being floated for them. However, there is another “C” in the “C” shaped recovery – the Corporation. That will be next. Note: I contributed this post to the Sourcing Innovation Blog as well.